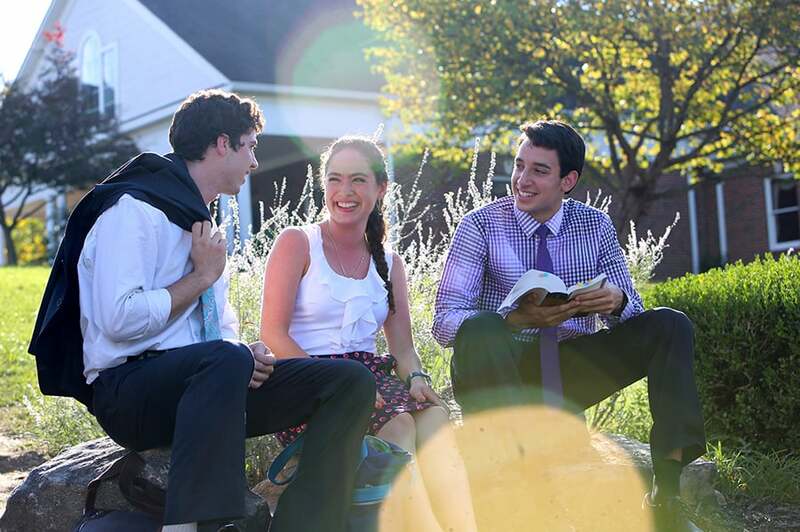 Christendom College provides a timeless and challenging Catholic liberal arts education. It is the same education received by the scientists, scholars, heroes, and saints that have marked the 2000-year history of Christendom. Rather than educating students in truth and wisdom, American universities and colleges have stripped their coursework of the liberal arts and have focused on specialized job training. While the immediate pursuit of a technical degree following high school may result in the rapid development of a vocational skill, the student’s mental powers and habits are narrowed through this process. The graduate of this technical instruction resembles a cog in a machine, useful in its place, but often incapable of the vision and adaptability needed for a life of leadership and excellence. This limited and technical vision of education has resulted in a culture of mediocrity and relativism. Conversely, through the study of Catholic liberal arts, the student encounters a universal study of knowledge—through Mathematics, History, Literature, Classics, and Political Science—unified by the central role played by Philosophy and Theology. By seeking the truth through various disciplines the student cultivates a new intellectual power enabling him to master any subject. As Blessed John Henry Newman observed, the student attains an intellectual prowess in which he can take up any career and thrive with competence, grace, versatility, and success. Unlike the non-liberally trained, the Catholic liberal arts student becomes equipped for a life of leadership and excellence. Christendom College is one of the last institutions of higher education where students can receive a formation in the perennial and authentic Catholic liberal arts education envisioned by the Church for two millennia—most recently by Pope St. John Paul the Great in Ex Corde Ecclesiae. The curriculum and committed faculty are complemented by a culture of unmatched personal attention helping each student discern and develop his academic and vocational goals. No matter the particular vocation, a Christendom student is enriched and ennobled for all employments of life, including his faith, family, and profession. As a fruit of this timeless education, the Christendom graduate acquires a habit of mind that enables him to understand and discern truth in every challenge, while at the same time, think critically, be creative, problem solve, conceptualize, and communicate clearly. The Christendom liberal arts education is an experience that prepares men and women for the world. It is an education that flows out of the classroom and into a lived experience. Every student enjoy countless leadership opportunities, while benefiting from a vibrant Catholic culture and the support of a Christ-centered community. From over 100 annual student-run festivals, dances, and fine arts productions to 16 competitive varsity and intramural sports programs, each student strengthens his talents and plays a vital role in the campus life of the college. Whether in Virginia, Rome, Ireland, or missions across the world, each student is given the experiential tools needed to engage society and to lead others to Christ and His Truth. Christendom’s education is not an education for the faint of heart, but for those willing to accept the bold and challenging call from God to become the great men or women that He wants them to be. Dare to join us. Dare to be great.